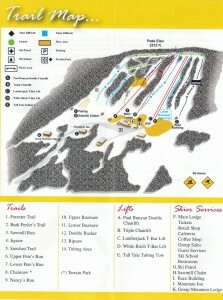 Ski Sawmill Family Resort has 12 slopes and 4 lifts and 1 tubing tow. Our peak elevation is 2,215 feet and our base elevation is 1,700 feet – giving us a vertical drop of 515 feet. There is also a terrain park adjacent to our double chairlift. New this year you will find a NEW Tube Slide which features four runs, one lift, and a powerful snow making system to ensure a great ride.